My wife had to carry most of the load in central Ohio over the past week or so while I was on my annual Michigan fishing trip. Based on the following pictures, many of which are hers, she had no trouble discovering things of interest. 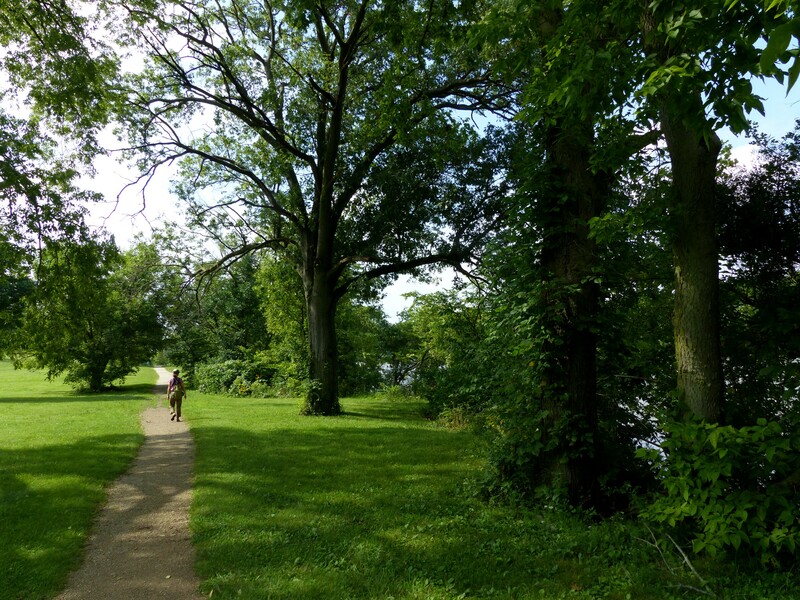 Nature walk, Griggs Reservoir Park. First there were the birds, a few of which when captured in unusual or even comical poses. Some just a little different than the usual “mug” shot. 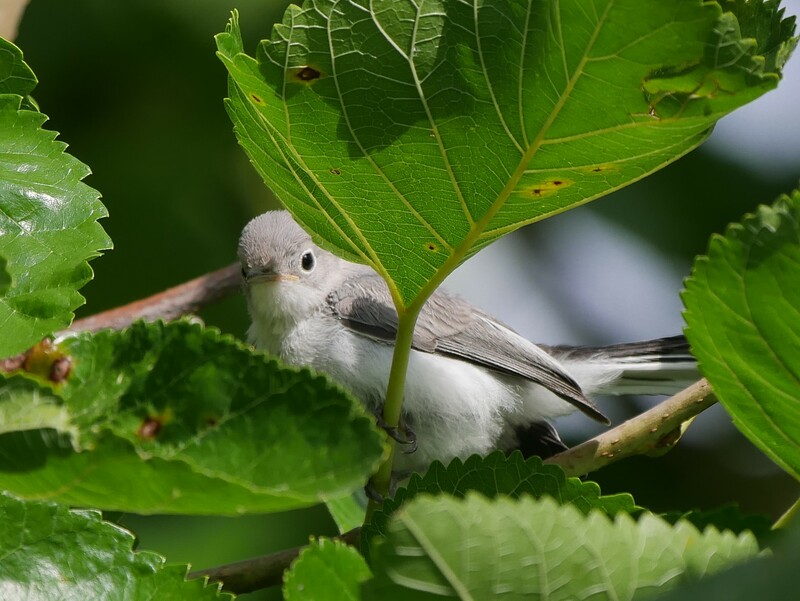 Blue-gray Gnatcatcher, Griggs Reservoir Park, (Donna). Just fledged Catbird, Griggs Reservoir Park. Great Blue Heron, Griggs Reservoir Park. 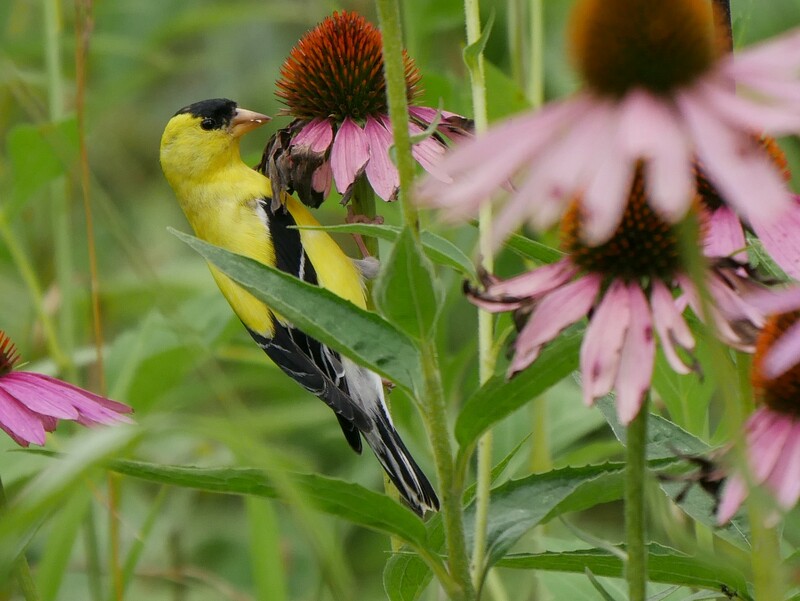 Goldfinch, Griggs Reservoir Park, (Donna). Northern Rough-winged Swallow, Griggs Reservoir Park. 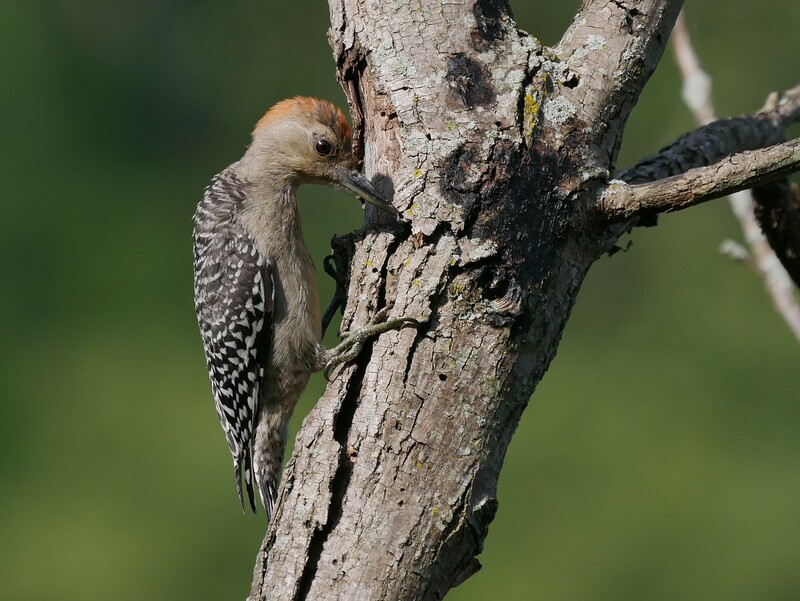 Immature Red-bellied Woodpecker, Griggs Reservoir Park, (Donna). 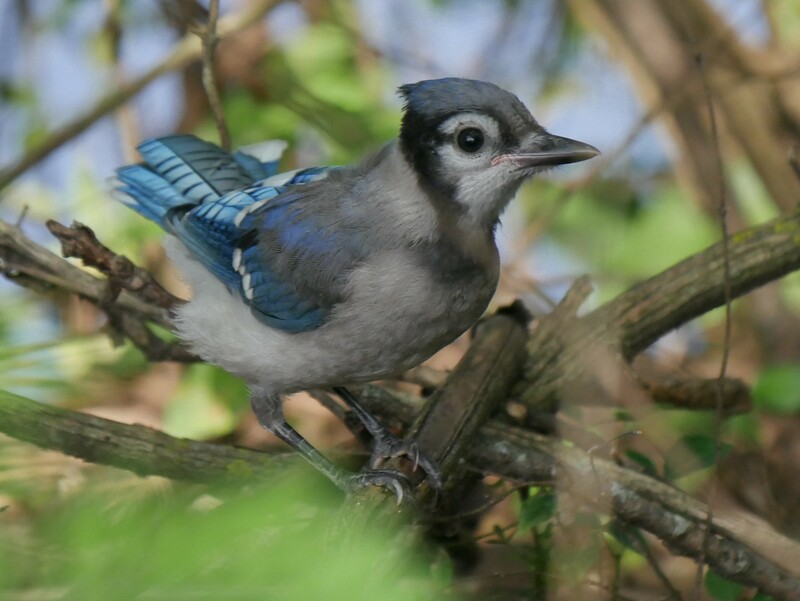 Immature Blue Jay, Griggs Reservoir Park, (Donna). 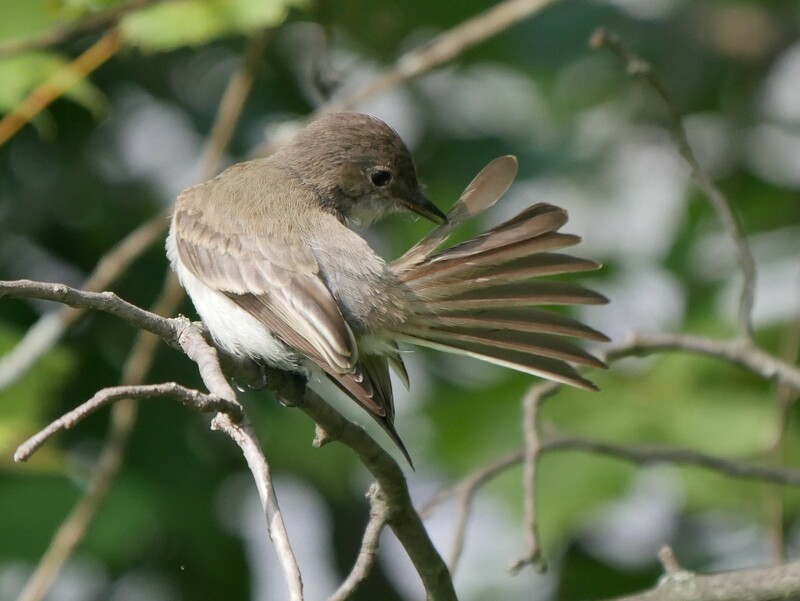 Preening Eastern Phoebe, Griggs Reservoir Park, (Donna). 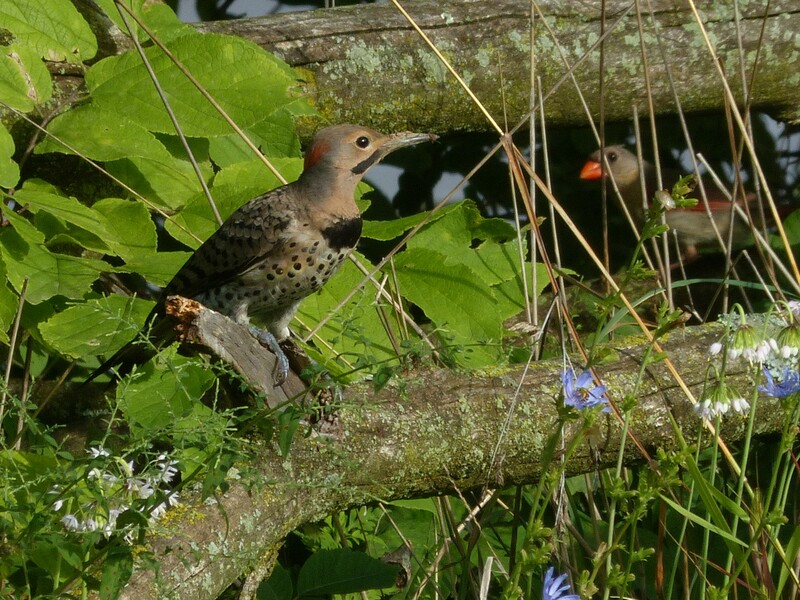 Northern Flicker, Griggs Reservoir Park. 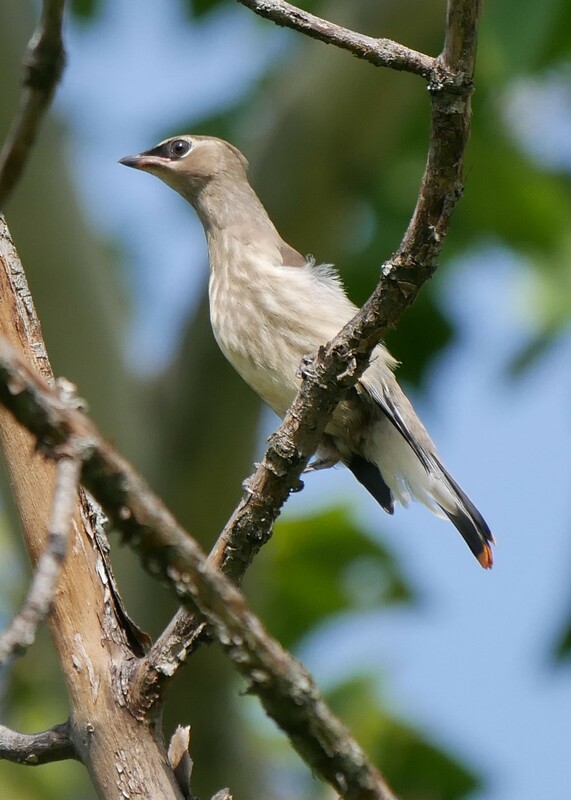 A juvenile Cedar Waxwing stretches it’s neck, Griggs Reservoir Park, (Donna). 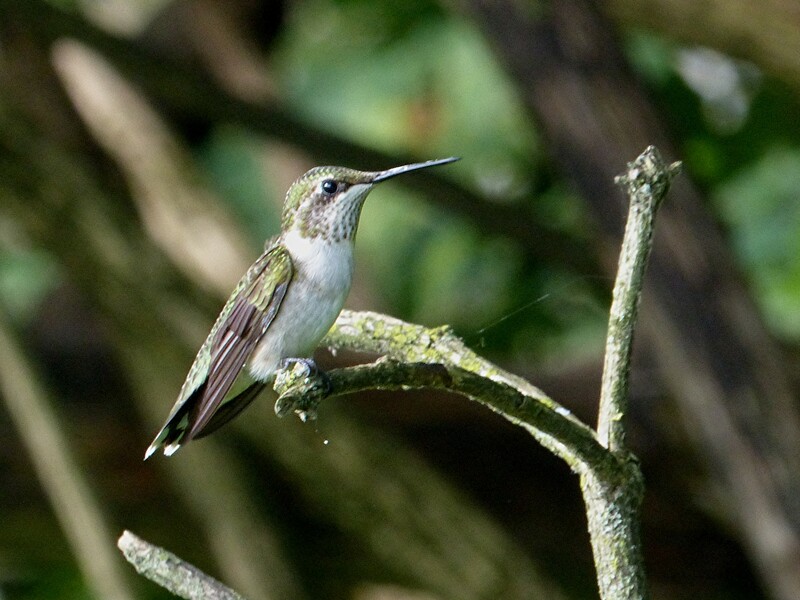 A female Ruby-throated Hummingbird visits Donna as she looks for caterpillars, Griggs Reservoir Park. A Cardinal is caught spying on a young Northern Flicker, Griggs Reservoir Park, (Donna). Juvenile Green Heron, Griggs Reservoir. To cute to pass up, Griggs Reservoir Park, (Donna). Sometimes a bird picture was obtained as my wife happened to look up as she studyed an interesting “bug” and there were apparently no shortage of those. 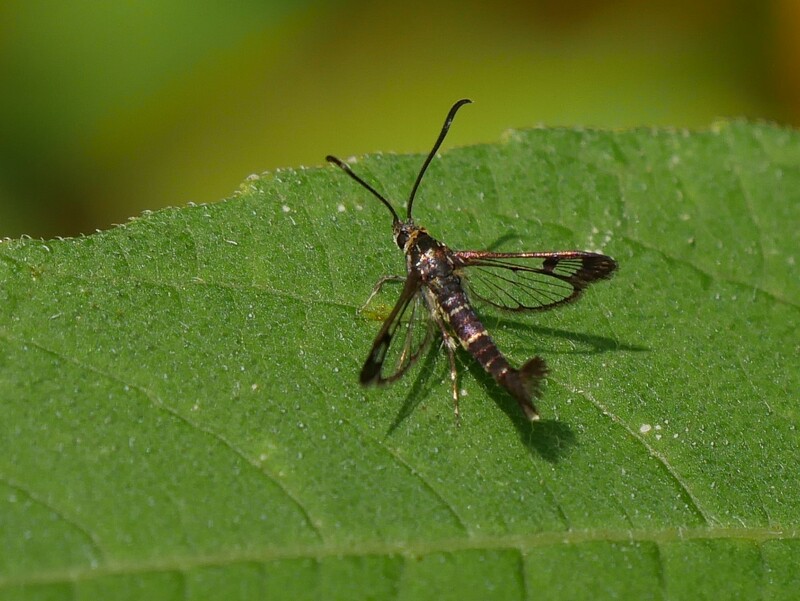 Eupatorium Borer Moth , Griggs reservoir Park, (Donna). Milkweed Tussock Moth Catapillar, Griggs reservoir Park, (Donna). 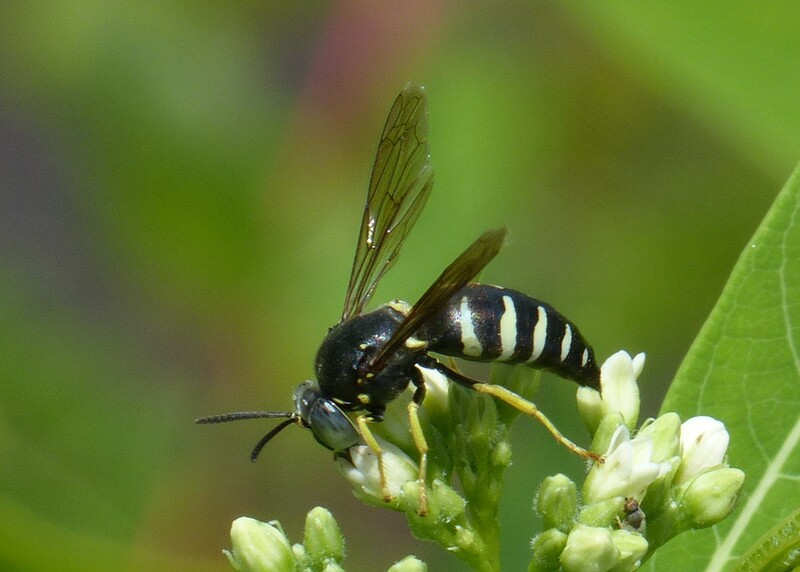 Wasp, Griggs reservoir Park, (Donna). Monarch Butterfly caterpillar, Griggs Reservoir Park. 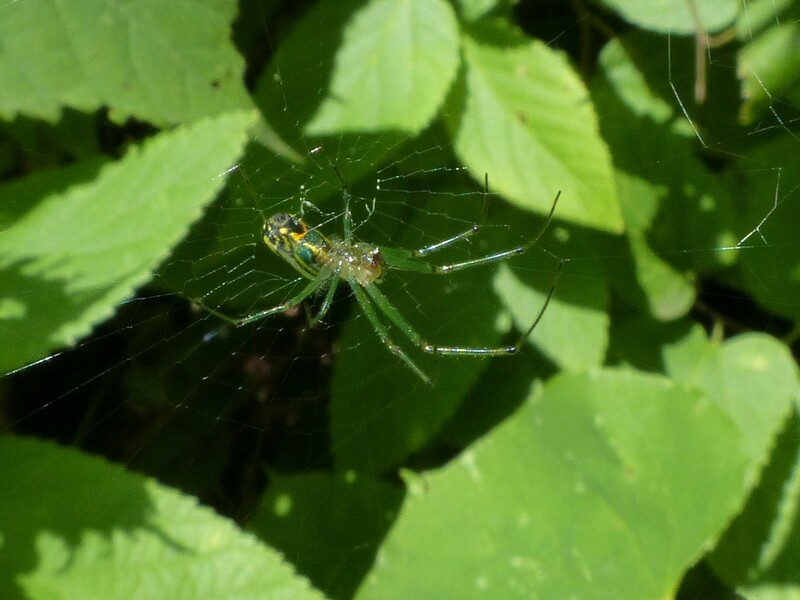 Orchard orbweaver, Griggs reservoir Park, (Donna). 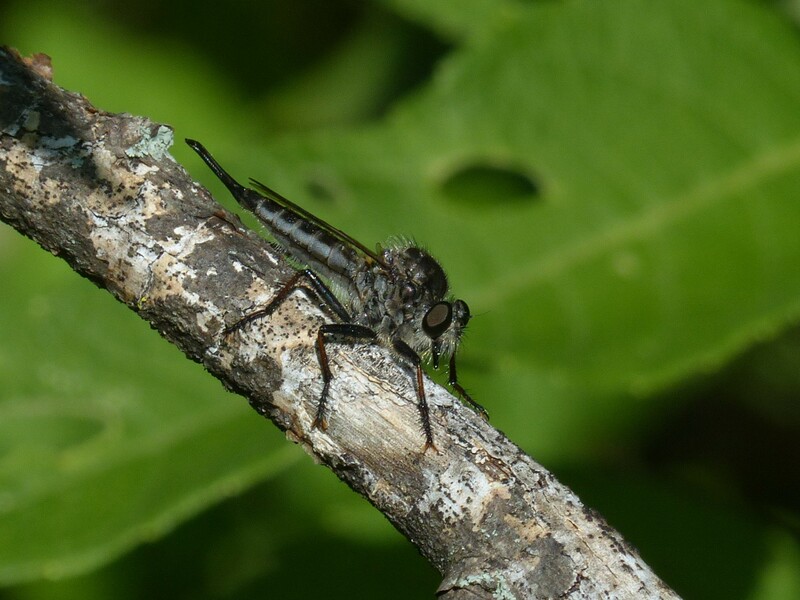 Donna spotted this Robber Fly in Griggs Reservoir Park. 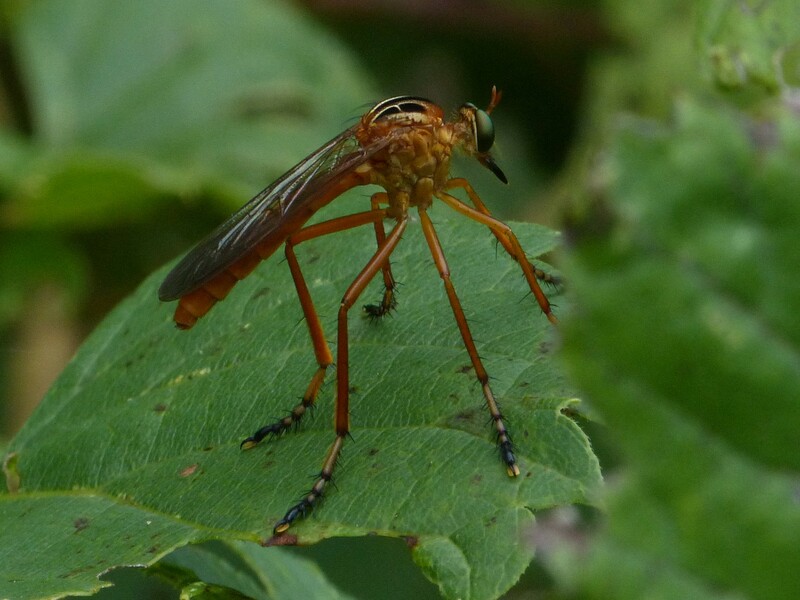 Robber flies prey on other flies, beetles, butterflies and moths, various bees, ants, dragon and damselflies, ichneumon wasps, grasshoppers, some spiders and even other robber flies. They do so apparently irrespective of any offensive chemicals the prey may have at its disposal. Many robber flies when attacked in turn do not hesitate to defend themselves with their proboscides and may deliver intensely painful bites if handled carelessly, (Ref: WIKI), Griggs Reservoir Park, (Donna). 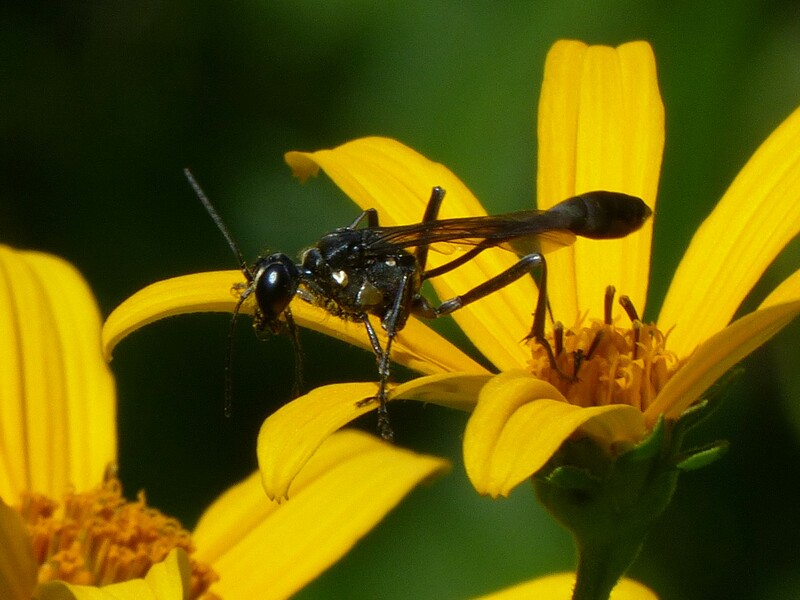 Sand Wasp, Griggs reservoir Park, (Donna). 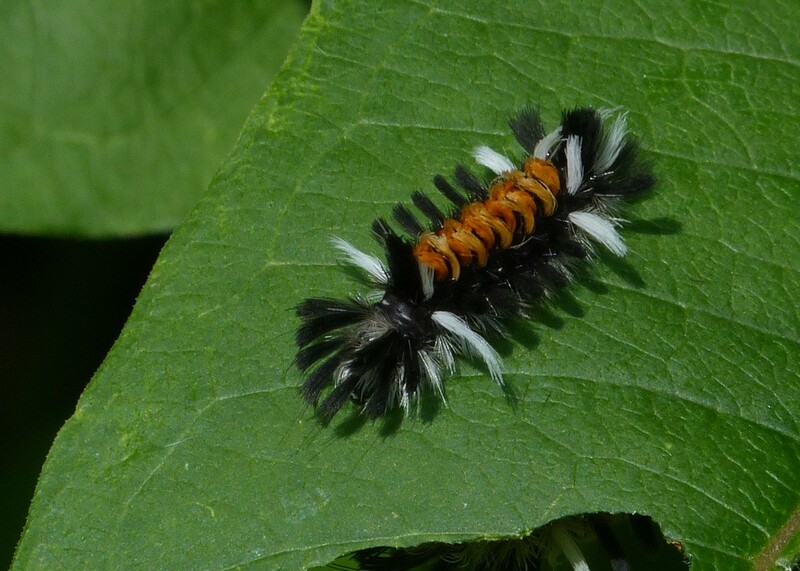 Sycamore Tussock Moth caterpillar , Griggs reservoir Park, (Donna). Robber fly, Griggs Reservoir Park, (Donna). 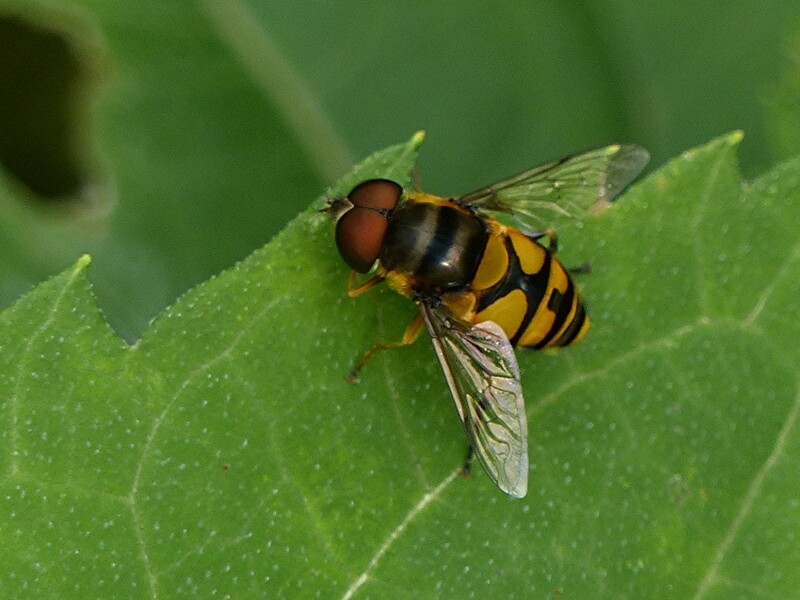 Hover fly, Griggs Reservoir Park. 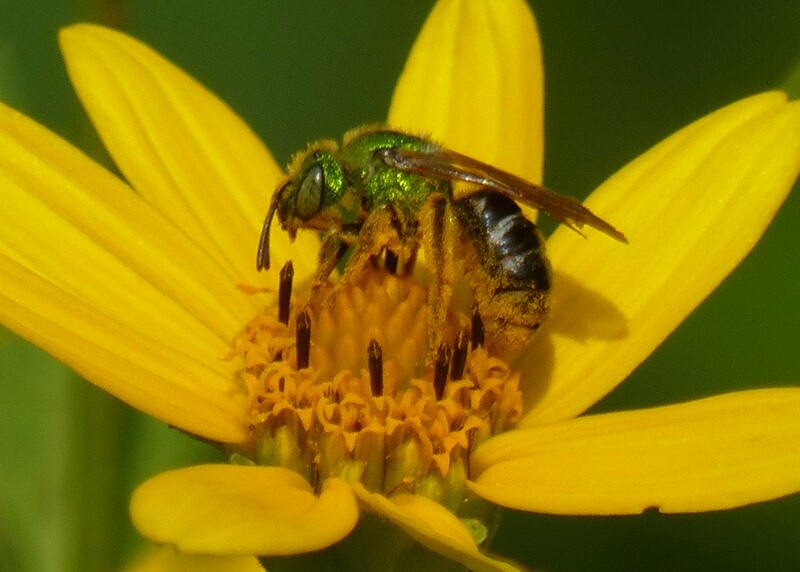 Green Bee, Griggs Reservoir Park. Orange Sulphur, Griggs Reservoir Park. 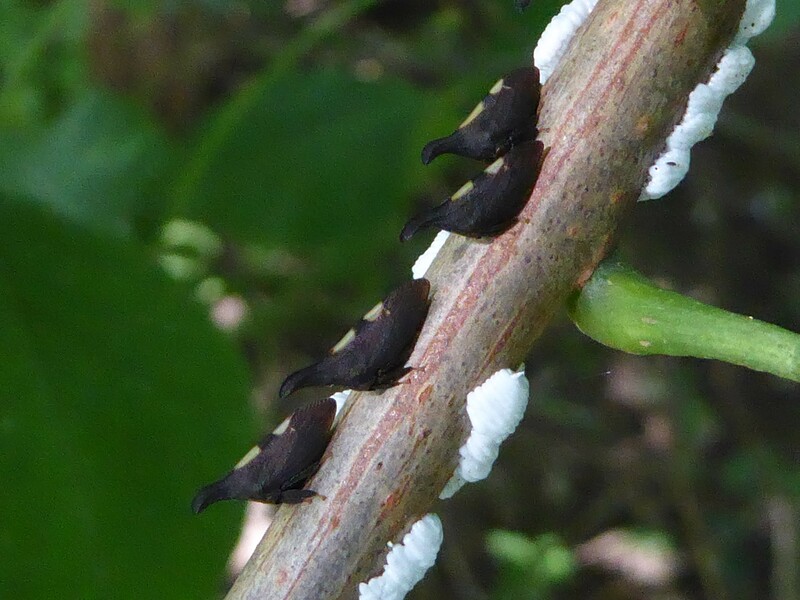 My wife spotted these 2-marked Treehoppers in Griggs Reservoir Park, “Treehoppers tap into the stems of woody and herbaceous plants with their beaks and feed on the sap. Treehopper species are often closely associated with a single food source. Some species gather in groups as adults or nymphs. They slit the bark of their host plant to deposit eggs within, covering the eggs with a secretion called “egg froth” that provides protection from desiccation in winter, may shield the eggs from predators, and that contains an attractant pheromone that brings other ovipositing females to the spot (where, like cows, they may line up, all facing the same direction). 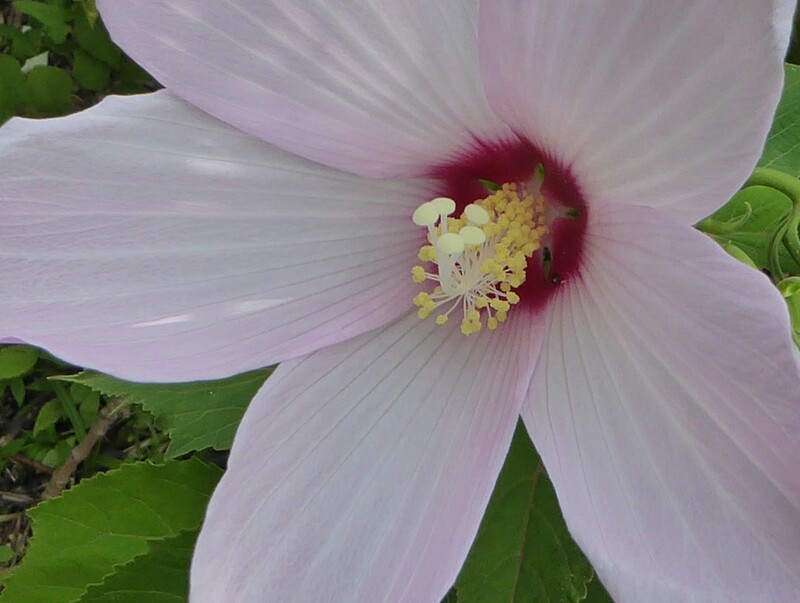 The eggs hatch in spring when they are re-hydrated by the rising sap of the host plant as its buds open and its shoots start to grow”. Ref: Bug Lady, Riveredge Nature Center. 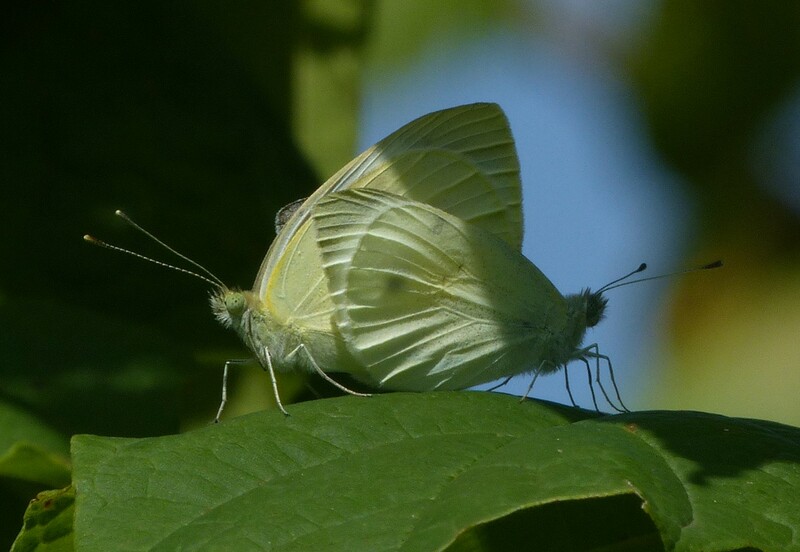 Mating Clouded Sulfurs, Griggs Reservoir Park, (Donna). 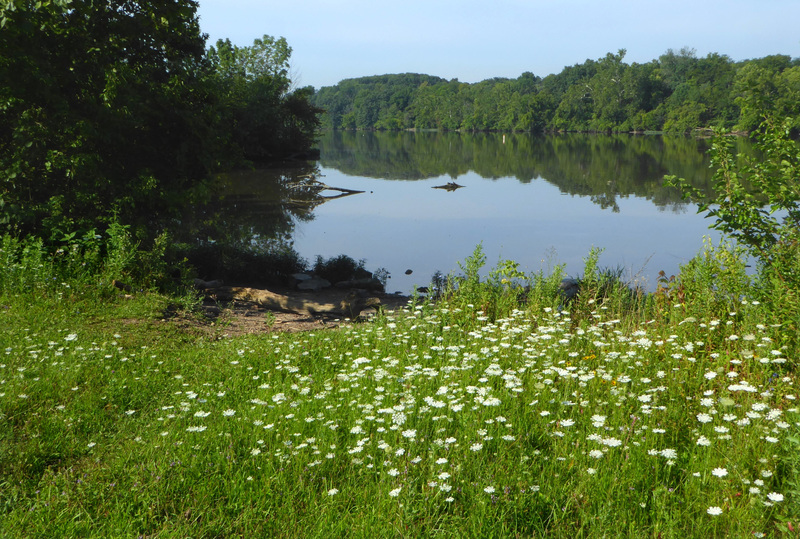 Summer flowers grace areas along the reservoir. 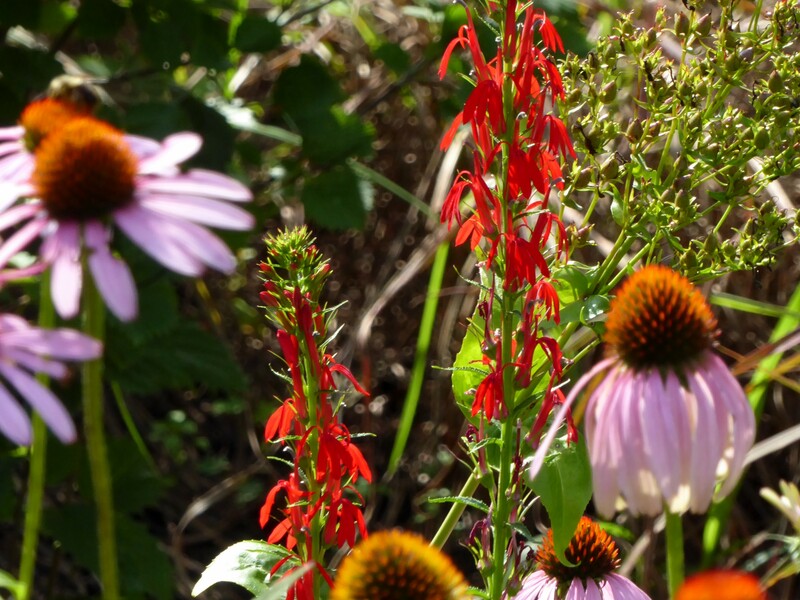 Coneflowers keep Cardinal Flowers company in one of the park rain gardens. Tall Blue Lettuce, Griggs Reservoir Park. Sunflowers rule this time of year. 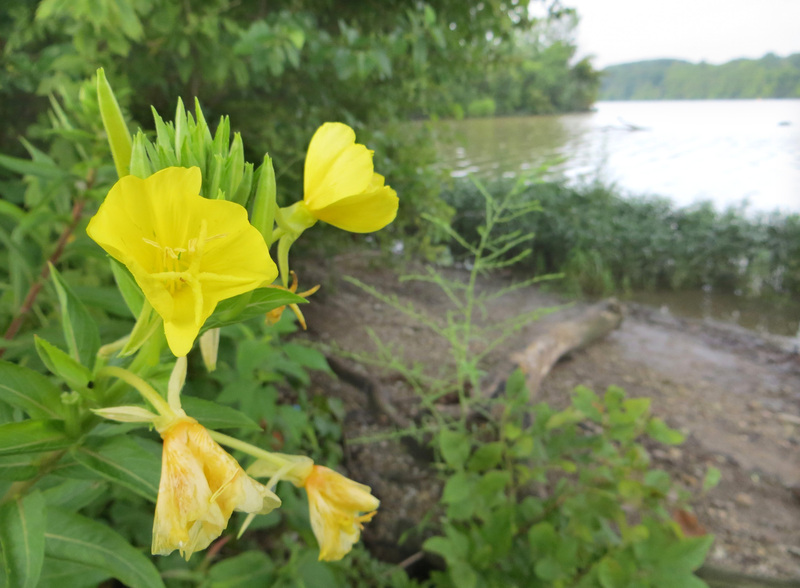 Square Stem Monkey Flower, Griggs Reservoir. Sunflowers draw one’s gaze to the reservoir beyond. Queen Ann’s Lace frames Griggs Reservoir. 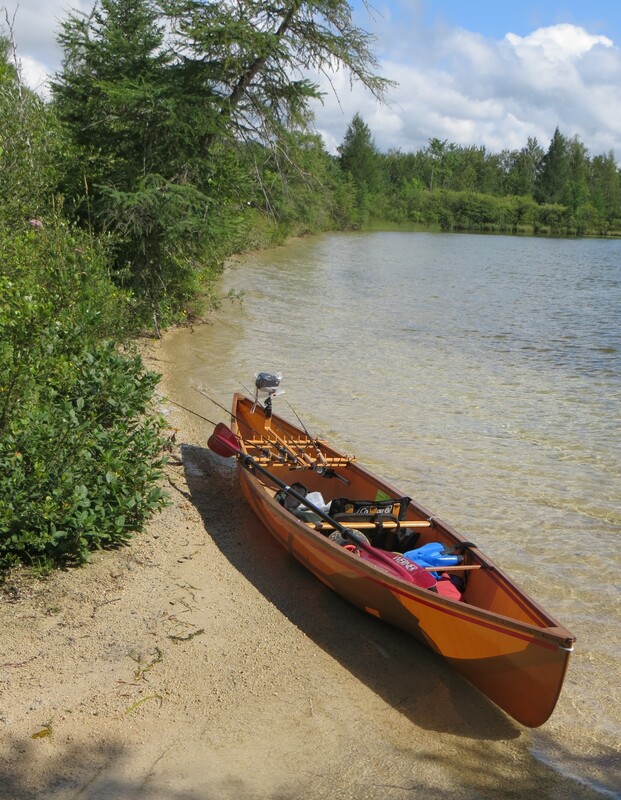 Finally a few pics from my fishing trip to the Rifle River Recreation Area. It always feels like a homecoming when I head north bringing back many fond childhood summer vacation memories. I always think I’ll take more pictures on this trip but it’s hard to wear two hats so I mostly just allow myself to be there and fish. 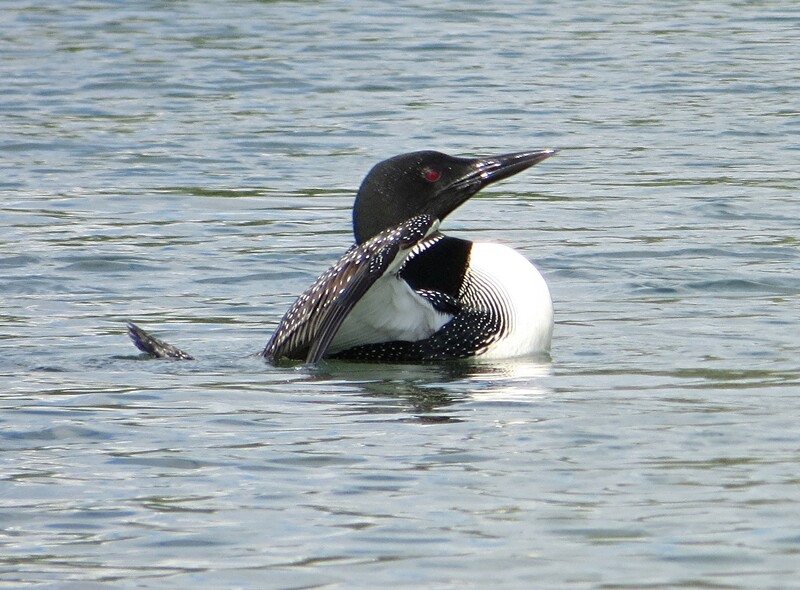 Common Loons are a real treat on Devoe Lake in the Rifle River Rec Area. Seemingly unconcerned they swim close to my canoe. 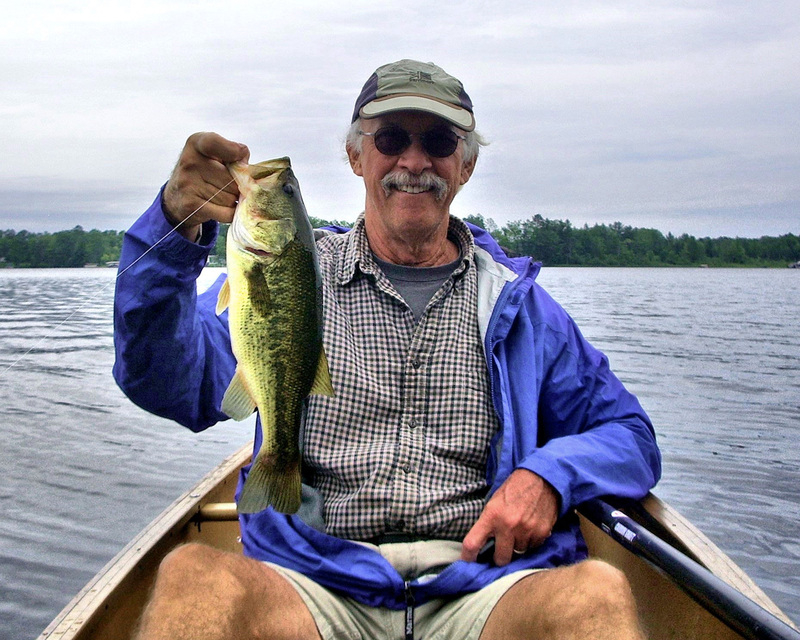 One of a number of nice bass caught and released. Each trip into nature marks the passing of time. 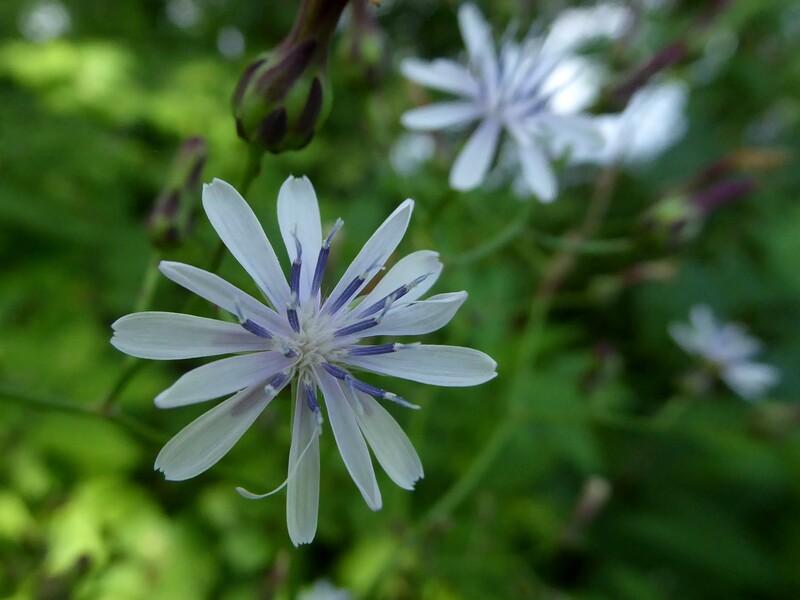 Summer moves along, things seen are ever changing, birds fledge and mature under parent’s attentive care, caterpillars and butterflies continue their amazing dance of life, wildflowers and bees are ever present companions, by late July the days have grown noticeably shorter. Should you wish prints from various posts may be purchased at Purchase a Photo. If you don’t find it on the link drop us a line. 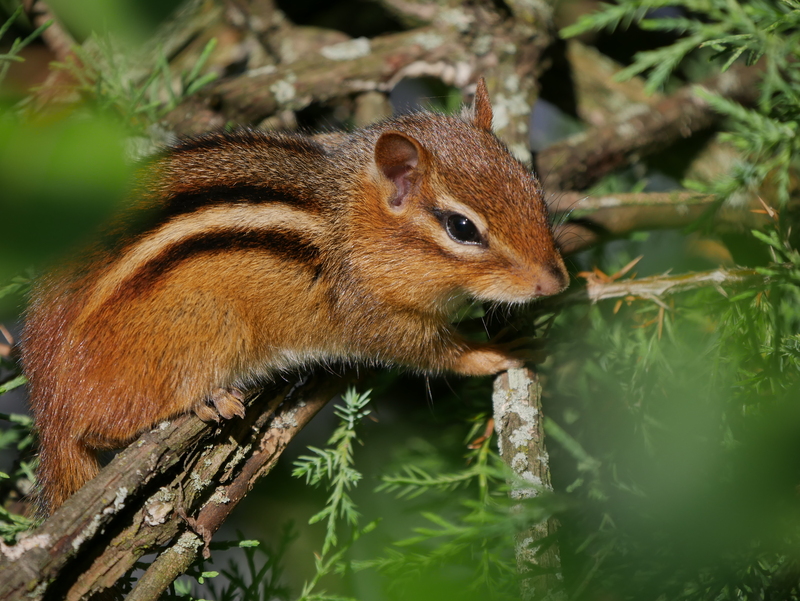 ← On The Shoulder of Very Small Giants! 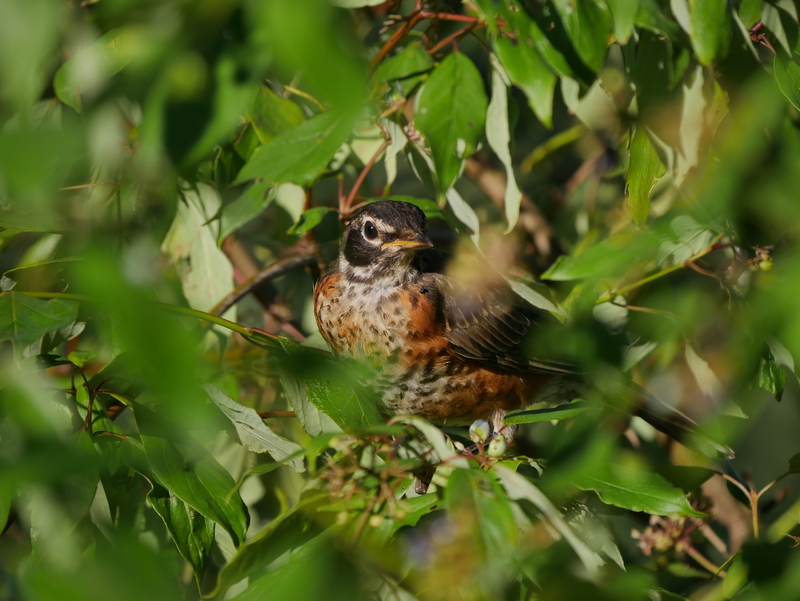 So many young birds… and great photos of same. Unusual bugs too… not many can make a wasp so interesting. Thanks for posting. Great pictures. Such a variety of wildlife well captured. 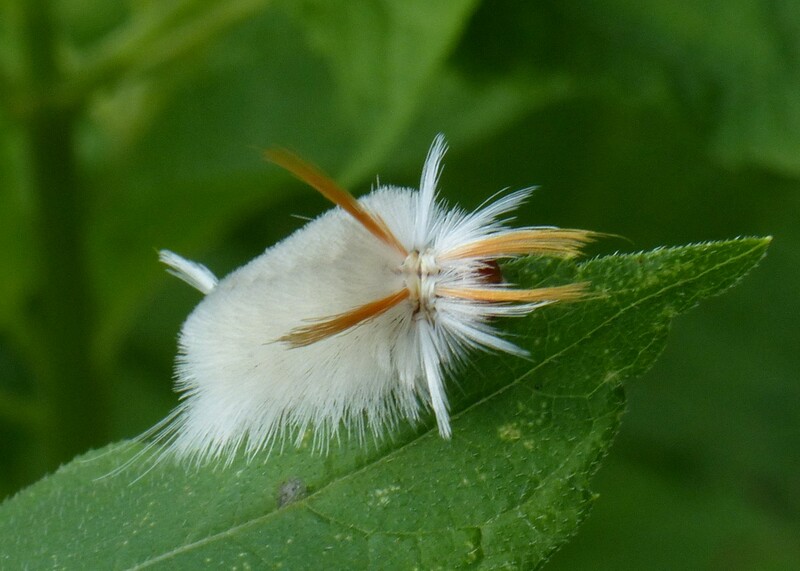 I must say that I thought that the Milkweed Tussock Moth Catapillar was the shot of the post until I saw the Sycamore Tussock Moth caterpillar. You both got some great shots! I’m still hoping for loons.